Describes how to get started with the Interrupt platform service. The Interrupt Technology Guide describes the key concepts of the Interrupt platform service. The Interrupt Client Interface section describes the Interrupt platform service API and its use by device drivers. 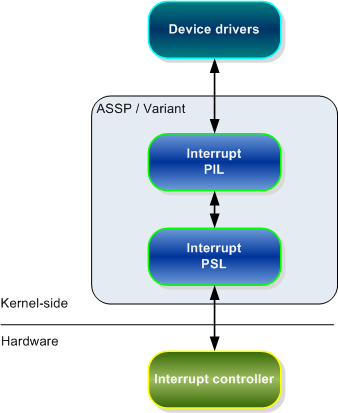 The Interrupt Implementation section describes the implementation of the Interrupt PSL. The Interrupt Build Guide describes how to include the Interrupt platform service in a ROM image. The Interrupt Tools Guide describes the tools that are specific to the Interrupt platform service. The Interrupt Testing Guide explains how to test the functionality of the Interrupt platform service. The Interrupt platform service provides an interface between the interrupt controller in the hardware and device drivers in the kernel-side. The Interrupt platform service is implemented in the ASSP/Variant module. Device driver developers – to bind and unbind interrupts. Hardware implementers and base port developers - to implement an interrupt dispatcher to manage interrupts.